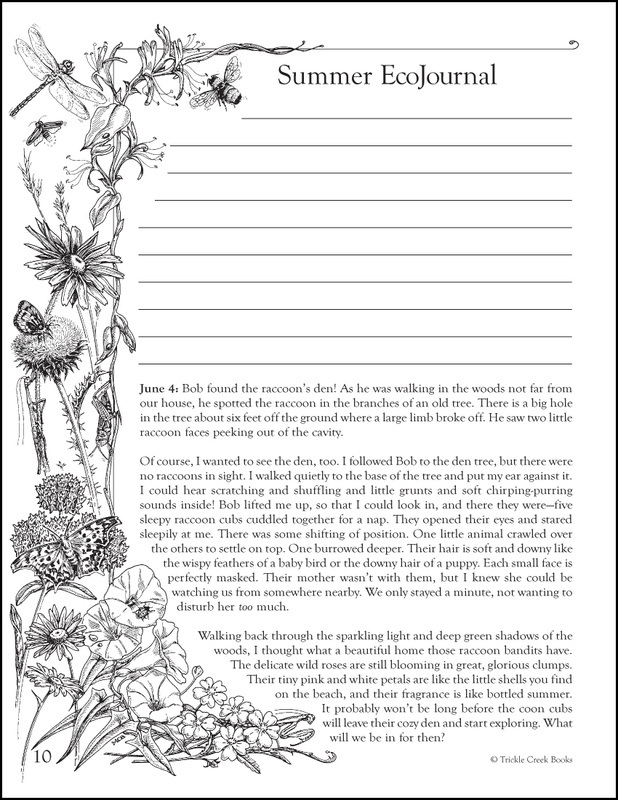 Four EcoJournals, one for each season, invite kids to explore the seasons with unusual nature activities. The series, based in solid science, was written to encourage children to observe and explore nature more and more closely and then to write about their experiences and observations. Entries from the author’s nature journals serve as models for children’s nature writing. The books include exquisitely illustrated writing pages for children, short entries from the author's nature journals that reflect her irrepressible delight in the natural world, and dozens of nature activities for children to try. Kids learn to develop a deep love and respect for the environment. We are proud of being recognized by major publications. Read what they have to say about these books. “There's a whole world of nature waiting for you, and it's closer than you think.... Read A Kid's Spring EcoJournal: With Nature Activities for Exploring the Season by Toni Albert (Trickle Creek Books)." 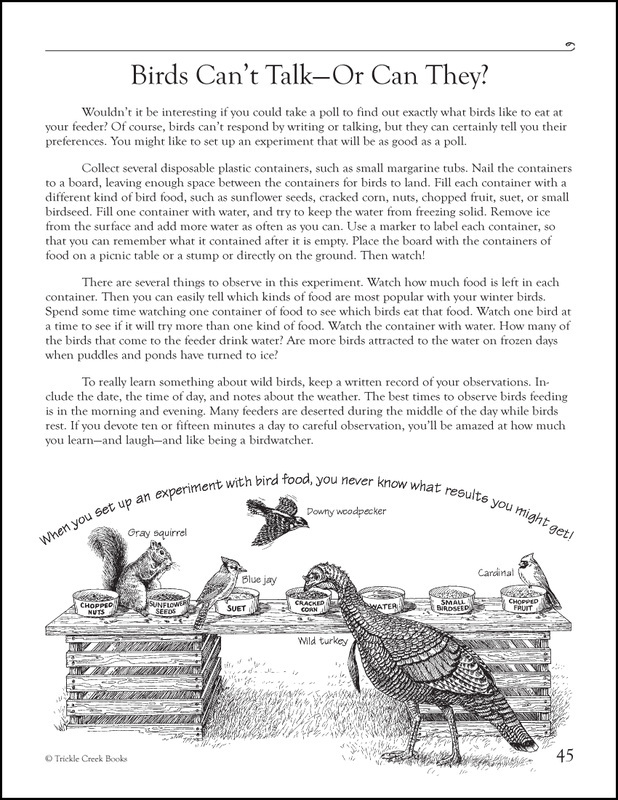 "This series of EcoJournals -- one for each season -- has illustrated, reproducible writing pages and is packed with scientific nature activities. Short entries from the author's own nature journals invite kids to read about nature and inspire them to write about it." "While [Trickle Creek Books'] whole list is dedicated to the idea that those who learn to love the Earth today will protect it tomorrow, we were particularly impressed by a series of four EcoJournals, one for each season....These books are science-based, lots of fun, exploration-oriented, not condescending, and suitable for a variety of ages, from about eight and up. Their unstructured love- for-learning approach makes them perfectly suited to life learners of all ages." "The EcoJournals help children develop observation skills and a respect for the environment. The books present excerpts from Albert's own nature journals and space for kids to write their own entries. 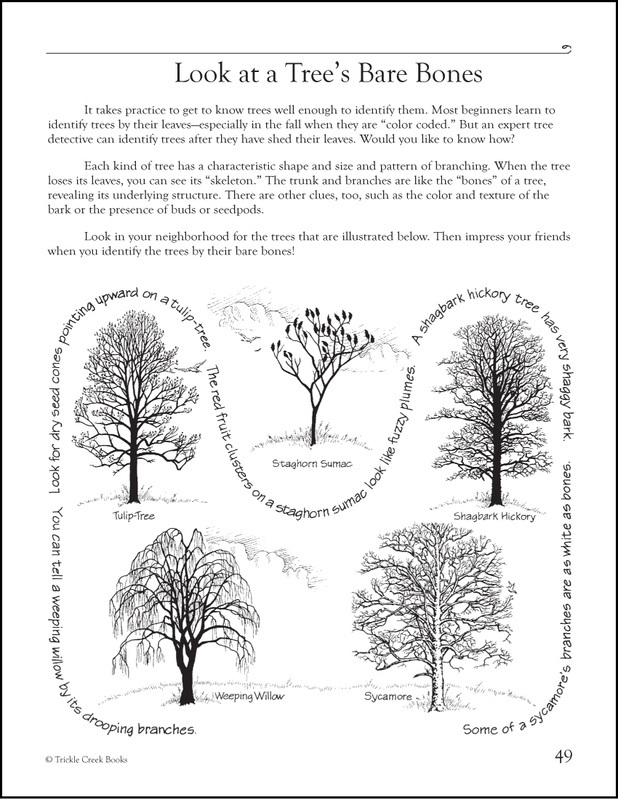 They also contain black-and-white illustrations, suggestions for what to write about, and tips for exploring nature." "A Kid's Winter EcoJournal is filled with over 50 fun nature-inspired activities for exploring the season.On the left-hand side of each page of the workbook, readers find Ms. Albert's daily journal entry. Above her entry, she provides space for your entry! And that is one of the things I like best about this guide; the author models nature journaling, rather than simply telling readers how they should do it (of course, she does that, too...very gently, in the Introduction). Now, on the right-hand side of the workbook -- that is where things get exciting! Every day Albert offers readers unique suggestions... from making a nature wreath to gathering goodies to make Woodpecker Pizza! And she even shows us how to use cabbage leaves to test for acidity in snow!" "Teaching kids to care for the Earth" is the credo of Albert's work and the theme of her publications. An experienced teacher, she researched nature education programs and activities at her 20-acre wooded site in Mechanicsburg. These meticulously illustrated EcoJournals are guides that will draw youngsters into experiencing their own backyards or parks. They are encouraged to conduct specific collecting and study projects and activities that will help them understand and appreciate the naural world. Highly recommended for home, neighbor-hood youth groups, and elementary school use." "The EcoJournals by Toni Albert are very appealing and charming. As I browsed through A Kid's Spring EcoJournal, I found a page entitled, 'A Worm is a Sign of Spring.' Besides information on worms, there's information on building your own worm habitat in a CLEAR plastic container that is then covered with black paper. When you want to observe the worms, just pull off the dark covering. What a great idea!" "A Kid’s Winter EcoJournal is another wonderful book to add to your child’s library. There are four books in the series, one for each season. Toni Albert delivered yet again with this book. It’s set up by date starting December 1st and going until February 28th.... Each section has a journal area for your child to write in. This is a book I plan to keep in my daughter's file of school. She loved coloring in the birds on the edges of each page. The detailed art is wonderful. We have had so much fun that I’m already planning on buying the other three books in the series so we can continue our EcoJournal adventures." There are four EcoJournals, one for each season: A Kid's Spring EcoJournal, A Kid's Summer EcoJournal, A Kid's Fall EcoJournal, and A Kid's Winter EcoJournal. They are written by Toni Albert, illustrated by Margaret Brandt. attract moths with a "shining sheet"
“During the winter, little white-bellied deer mice invade the machines that are not being used—the rototiller, the lawn tractor, and the log splitter...It has become an annual event for us to catch some mice in the spring and keep them for a few weeks in a terrarium. It gives us a wonderful chance to observe them. As soon as the little mice are grown, we release them outside. Even though we can’t resist giving them names, we know they are not pets. They are little wild animals that are not meant to live in a terrarium. They have things to do in the world and mouse lives to live."